Premier Hon. Andrew Fahie announced that he would be an unconventional leader and that his government will do things in an unconventional way. 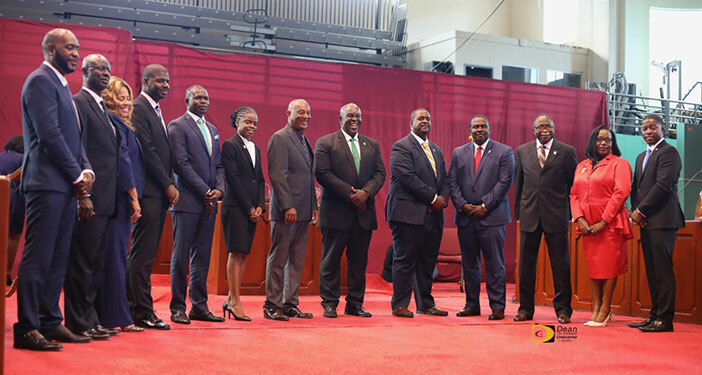 The BVI Leader made this announcement during the swearing in ceremony of the Ministers of Government that was held at Government House on 1 March. The Premier said that there is a formula for the type of governance that they intend to deliver to the Territory. “We intend to run each Ministry as if it were the people’s Ministry. I’ve spoken to each Minister and warned them that no one Minister will run a Ministry as if they are in government alone; we will make sure that this is run in unity, togetherness;” Hon. Fahie said. He added that he has already cautioned his Ministers and informed them that there is expectation that they will carry out their functions in a transparent manner. In fact, Hon. Fahie said the Ministers were informed that they will be relieved of their duties if they are found to performing in a less than favorable manner. “I have spoken to each Minister and I have told them to make sure that we stay transparent”. There were changes to the portfolios of ministers and when the information was first leaked there was concern among members of the public as to the rationale for some of the adjustments. For instance, telecommunications was added to the Ministry of Health and Welfare.